Mix all the ingredients for the crab cakes (excluding the remaining 1tbsp flour to coat and the 1tbsp sesame seeds). Place the mix in the fridge to harden slightly before forming into cakes. Meanwhile, mix the slaw ingredients together and set aside. 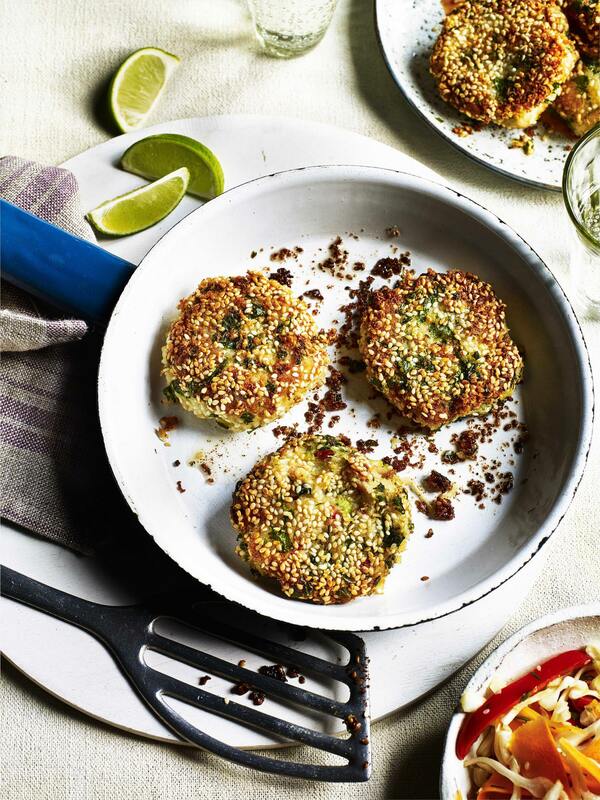 Take the crab cake mix out of the fridge and form into patties, dusting each with flour (and sesame seeds if using). Heat a large frying pan and pan fry the patties in groundnut oil for about 2 minutes each side, or until golden brown. Serve with the slaw. TIP Use leftover boiled potatoes.